In 1985, Dennis McKenna, brother of the late Terence, travelled to Pucallpa, the fastest-growing town in the Peruvian Amazon, to work on an ethnobotanical project with Luis Eduardo Luna. During this trip they encountered Pablo Amaringo, living with two adopted children, his mother and several other family members in a very humble house in a swampy area of one of Puccallpa’s poorest districts. At first Amaringo seemed shy. However, as he gradually gained eloquence, they realised he knew a great deal not only about the region’s flora and fauna, but also about its shamanistic and mythological traditions. He explained that although he no longer practiced medicine, he had been a vegetalista, a traditional healer who derives his knowledge from plants, for many years. Pablo was born the seventh of thirteen children in 1938 in Puerto Libertad, a small settlement on the banks of a tributary of the great Ucayali river. Pablo traces his roots to several indigenous groups, on both his father’s and mother’s sides which include the Cocama, Lamista and Pero tribes. Several of his ancestors were healers. His paternal grandfather, Ambriosa Amaringo Vazquez, was a muraya, a particularly powerful type of shaman who could apparently make himself invisible to others at will. His mother’s three brothers were also practising vegetalistas. When Pablo was just a boy, his family were reduced to extreme poverty after some years of relative prosperity. As a result, they moved to Pucallpa where Pablo attended school for just two years before he was forced to find work to help support the family. When he was 17 Pablo became extremely ill, nearly dying from severe heart problems. For over two years he could not work. Eventually he was cured by a local healer. It was while recovering from this illness that he started to draw and paint for the first time. Pablo began making drawings with pencil and shading with soot from lamps. From a friend employed in a car factory he got permatex, a blue substance with which he coloured the drawings. He had no money for paper so he used cardboard boxes. Sometimes he took a little lipstick and other cosmetics from his sisters. Later he used ink, watercolours and then a friend gave him six tubes of oil paint. Soon Pablo began to make money from portraits, but lost his market when photographers began to colour black and white prints. With the discovery of his new artistic talent Pablo’s healing powers were also exposed. For seven years, 1970-76, he travelled extensively in the region acting as a traditional healer. But he later abandoned this activity. When Luna and McKenna met Pablo in 1985 he was living in great poverty, barely surviving by teaching English to young people from his home and selling the odd painting to passing tourists. Luna suggested he paint some of his shamanic visions, a project which became the basis of a highly acclaimed co-authored book Ayahuasca Visions: The Religious Iconography of a Peruvian Shaman (North Atlantic Books). 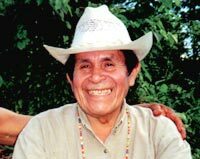 When painting his visions Pablo often sings or whistles the icaros (healing songs) he used during his time as a vegetalista. Then the visions return once the image is fixed in his mind – he is able to work simultaneously with several paintings, quickly sketching the design and then filling with colour. He never makes corrections or overpaints, and he never discards a single sheet of paper. Pablo has transformed his home into a school where several dozen young people dedicate their days to the art of painting and drawing. Pablo teaches students to visualize internally what they are going to paint, in the way he does. The results have been astounding.